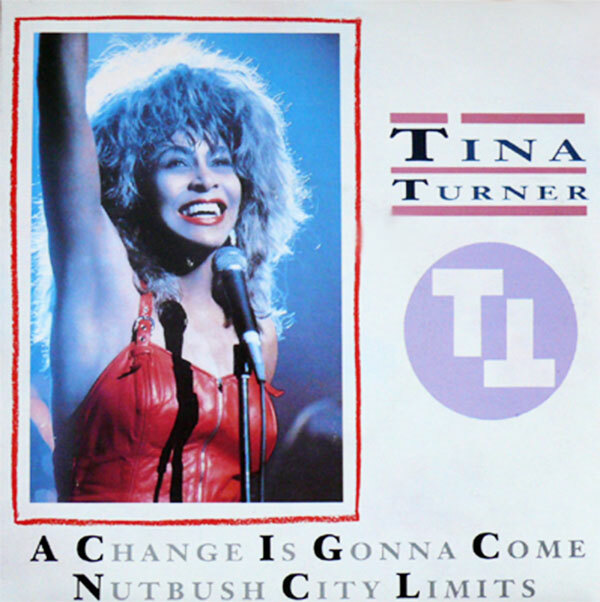 "A Change Is Gonna Come" is a single from Tina Turner's live album "Tina Live In Europe". It’s a cover. The song belongs to Sam Cooke. He wrote the song and released it in 1963 and the song became the single for the album "Ain’t That Good News". Unfortunately Sam already passed away when the song was released. The song describes the endless battle of racism that was inside of Sam Cooke himself. The song was inspired by Bob Dylan’s "Blowing In The Wind", which made Sam start to think that there were white people who didn’t want to be separated because of skin colours. After a concert Sam gave in Durham, he got inspired again by the words of protesters. Sam always wanted to write a song about the separation of black and white but was afraid to lose his fans on both sides. After he heard the protesters he started writing the words to the song "A Change Is Gonna Come". The song is also inspired on two other tragic events in Sam’s life. His 18 months year old son died of drowning in 1963 and later he was arrested for booking a concert in a white motel because of disturbance of public order. Just because he was black. These sentences of the song were based on these tragic events. "There have been times that I thought I couldn’t last for long/but now I think I’m able to carry on/It’s been a long time coming, but I know a change is gonna come". There were many artist who covered the song and the list goes on and on. Tina covered the song for the first time in 1983 when Martyn Ware wanted her to embrace her soul roots. He asked Tina if she had any idols of soul singers. She came quickly with the list: Wilson Pickett, Sam Cooke and Al Green. They’ve recorded the song "A Change Is Gonna Come" from Sam Cooke, but they never released the studio version as a single. They’ve decided to release Tina’s powerful version of Al Green’s "Let’s Stay Together", which became a hit on both sides of the ocean. 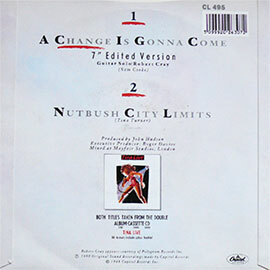 The studio version of "A Change Is Gonna Come" was later released on the compilation set "The Collected Recordings" in 1994. 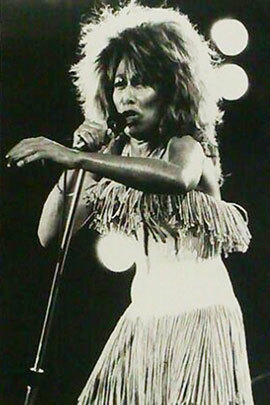 Back in 1986 Tina gave a concert in Camden Palace London, which is better known as The Break Every Rule Live Special. She decided to sing songs from her biggest idols including Sam Cook’s "A Change Is Gonna Come". Tina invited Robert Cray to play the bluesy guitar solo during the performance. When the music plays the first notes of the song, it thickens up your throat of emotion. And when Tina starts to sing the first lines of the song, it will break you down onto your knees and beg for forgiveness for all those people who suffered in these days. Tina’s strong vocals on this song will affect your whole body. We are so lucky that it was taped and recorded. 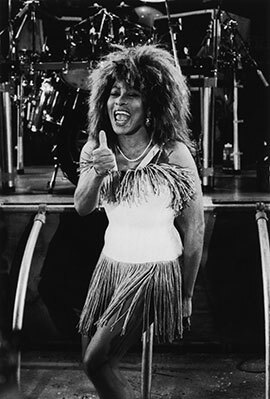 The song was released for the promotion of the "Tina Live In Europe" Album in 1988. For promotion they’ve used the video of the Break Every Rule Live Special. 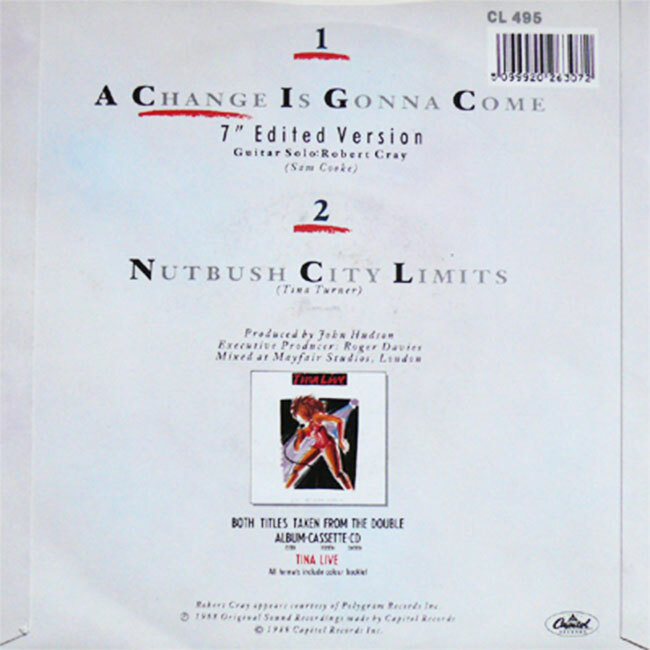 "A Change Is Gonna Come" Live was only released in certain European countries as 7" single and 12"single. 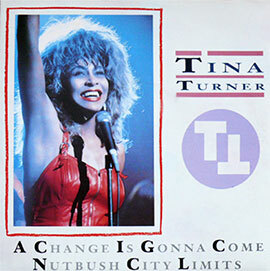 The B-side was the 1988 live version of "Nutbush City Limits", the wellknown Tina song which she wrote herself as a tribute to her hometown. We weren’t able to find any chart positions for the song. Everybody there keeps telling me "don't hang around"
And I say "Brother, please"